Gulf World Marine Institute, Inc (GWMI) is currently accepting applications for new volunteers. Volunteers with GWMI are crucial in the continued success of the long-term rescue, rehabilitation, and release program that currently exists at the facility, and we are inviting you to apply with us. Heavily incorporated in each aspect of GWMI activity, volunteers participate in the maintenance of the stranding response program, assist with husbandry and veterinary practices for the rehabilitation patients, assist in conducting postmortem study on deceased individuals, and help Gulf World contribute to national and international conservation efforts with all of the work they complete here. Interested applicants can click here to download the GWMI Volunteer Application Form. Sea turtle rehabilitation – Staff may ask for assistance with basic animal care, including but not limited to feeding, assisting with medical procedures, and cleaning tanks. This often occurs during the winter months, when oceanic water temperatures drop and sea turtles experience a phenomenon known as “cold stunning”. Cold stunned sea turtles have experienced a sharp drop in body temperature. Stranded animal response – GWMI responds to stranded marine mammals and sea turtles in Walton, Bay, Gulf and Franklin counties. Stranded animals must be responded to rapidly; live animals must be given veterinary attention either on sight or once back at the facility, and deceased animals will be assessed on sight or at a necropsy facility. Marine mammal necropsy – For marine mammals, a necropsy (animal autopsy) will be conducted in order to determine the cause of death, and more importantly, to gain insight into the general health of the species, populations, and environment these animals inhabit. Please keep in mind that these events are not for everyone, as they involve sights and scents that are unpleasant. Educational outreach – As a prominent advocate for environmental awareness, GWMI often participates in public outreach events. 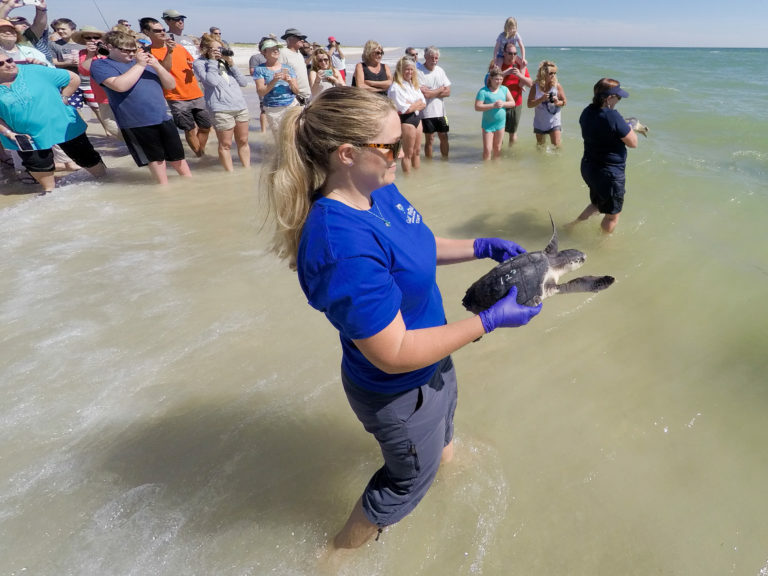 These range from table set-ups at larger events, to public sea turtle releases. Volunteers must be prepared to interact with the public, and will be responsible for representing the ideals supported by GWMI. *** It is important to note that, while the above-mentioned activities are a large part of what GWMI does, a large portion of the activities are related to preparation, organization, cleaning, and any other activity related to the day to day management of the program. The activity directly involving stranded animals is unpredictable, but GWMI needs volunteers for assistance with many other activities that relate to the overall success of these stranding events.